Super Bowl Sunday is the second largest day of food consumption behind Thanksgiving. It is estimated that Americans will eat 14,500 tons of chips, 4,000 tons of popcorn, and 450 million individual wings! Here’s a list of simple recipes for this year’s Super Bowl party! The most necessary food item at any Super Bowl Party! For Super Bowl Parties large and small, these little bundles of joy will kick start your Party! Deep Fryer required! Pump out a ton of these for major wing eaters. Picture a platter of these at your next party or even better, for a Super Bowl Sunday party recipe! We think this is the ultimate party dip! It’s massive! It’s DELICIOUS! Cheesy, gooey, meaty, delicious are words to describe this nacho recipe! Super Bowl Recipe! 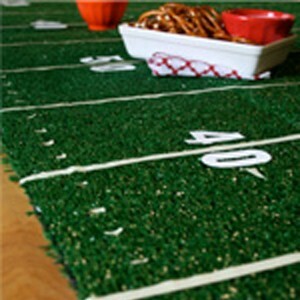 Next to guacamole, a must have for any Super Bowl party. Make it with 5 ingredients! Hot Dogs wrapped in egg roll paper makes one fabulously fun appetizer. Spicy, creamy, crispy jalapeno goodness! Oh my goodness, these meatballs are super simple and ready in 30 minutes! Great appetizer, pasta topper, or even sandwich! Red pepper hummus recipe, ready in under 10 minutes! Makes 2 cups! Poppin’ party dip recipe! Great Super Bowl Sunday recipe! French fries, chili, cheese, best combo ever! A quick and simple recipe as a snack for the kids or an appetizer on game day! Use your imagination for the filling. Makes 8 servings. Appetizer Meatballs with a sticky sauce! Yum! These little wontons are packed full of yummy goodness! If you like our avocado eggrolls, you’ll treasure this award winning recipe from Chris & Amy at A Couple in the Kitchen! This lighter version of taquitos won’t break the caloric bank! Low cal taquito?! Que? Si! Kid and adult approved! Serves 6-8. Yowza! This trendy dip is creamy and delicious with a kick! Serve with fluffy pieces french bread. Serves 6+. Beware of this heart-attack waiting to happen recipe! Mmm mmm good! Great for parties, barbecues, or a quick and fun appetizer. Buffalo sauce + quesadilla = a Meximerican masterpiece! 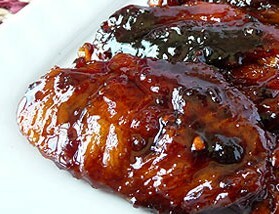 Sticky cola chicken wings! Very popular in China and trending in the states! Probably not your typical game day wings, but try something different! Crispy Thai spring rolls with ground chicken, garlic and lemon grass. Simple! Like the ones crafted out in front of the Staples Center. They can be good for football games too! Every party needs dessert, too! If you like pesto and you’re a fan of hummus, than you’ll love this basil hummus recipe. Football’s huge in the South. So is this protein-packed snack! Here’s a fun and simple ice cream cake recipe that can be thrown together in minutes! Easy, baked, fries that come out crispy and tasty. Make it in advance if you want and reheat when party starts. It’ll taste just as good. Call ‘em Pigs in a Blanket for your party. Don’t knock it ’til you try it! But maybe try it before you serve it at a party! Sure, a Super Bowl party should be far from gourmet, but why not impress the people?! If you’re lucky enough to live in BBQ weather in February, make these as an easy option. Maybe the most obscure of our Super Bowl recipe ideas, but why not, right? A healthy option for Super Bowl, if that’s your style. A fun and hip appetizer that are sure to please any fried calamari fan at the party! What a great fancy-ish dip for fries. Use as a dip for almost anything! Fresh ceviche is a spectacular appetizer and so easy to make in advance! Can’t go wrong with dips! Chances are no one else will bring this one.